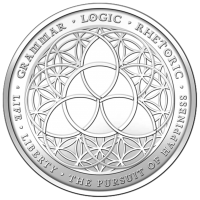 מטבע כסף טריביום שנת 2013 משקל חמישה אונקיות The first positive Medallion in the Silver Bullet Silver Shield series was the Trivium Medallion. This coin is a re-launch in 5 ozt size. The Trivium is the basis for all individuals to free themselves collective manipulation or toxic thoughts that hold them back from their destiny. It was based on the Trivium of Grammar (Observation), Logic and Rhetoric. Grammar (Observation) the rational and unemotional observation of symbols, situations or facts allows truth to be observed. Logic is processing the current set of facts and logically thinking about what will be the logical consequences of, or the best course of action in light of the observation. Rhetoric is the ability to tell either yourself or others of your observation and your line of thinking. The Trivium is the three step thought process that breaks the slave thought and allows the individual to become their highest and best self. The reverse shows Classic Silver Bullet Silver Shield Crest with the sayings "A Conscious Solution To Collectivist Problems" and "Listen To All. Follow None". The Silver Shield is flanked by 47 Silver Bullets representing the atomic number of silver. There is also a kite shield superimposed over the bullets and three symbols are etched into it: a key, an arrow and 5 exploding lines.